As part of Facebook’s internal audit post-Cambridge Analytica, Facebook announced the removal of several targeting features related to job titles and employers. Facebook has been relatively quiet about what they plan to reinstate for professional targeting. As of August 9th, Facebook announced that they are offering some new interest segments for reaching out to professional audiences. Additionally, they announced that some of their previous targeting features are soon to come back with updates occurring gradually. 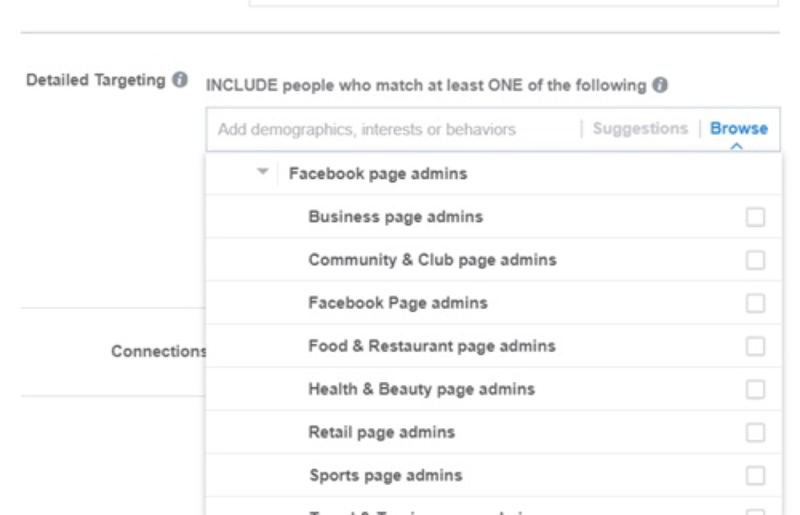 According to the Facebook, here are some of the reinstated and new professional targeting features you will soon be able to access within these segments. These are where you find the navigation flow for the updated targeting segments. You will be able to use the Browse option that is under Detailed Targeting, then follow the outline they provide. Employer and Job Title targeting are of special interest to advertisers since some of these features had been removed but will be returning soon. Let’s have a quick look at some of these features. Here is an existing addition for B2B targeting! When you go to Behaviors under Page Admins, you will find the number of Page Admin targeting segment accessible to you. If you click on page admins, you will see that there are some new options available. This segment is much larger than you would expect with over 350 million people to target. You can narrow your reach by targeting specific behaviors across these targeting options. Targeting is in the details. When you reach the people who potentially may use your products or services, you are more likely to succeed with Facebook Ads and marketing. Simply by choosing one of the behaviors within this detailed targeting segment you will narrow your results to fit your target market. Facebook Ads is smart and responsive, so it will generate new target numbers as you choose and alter your audience and behaviors. You can do this with any of the segments mentioned by adding and removing fields of interest, behaviors, and demographics accordingly for your needs. So, what do you think about the new and returning Facebook Ads features for professional targeting?